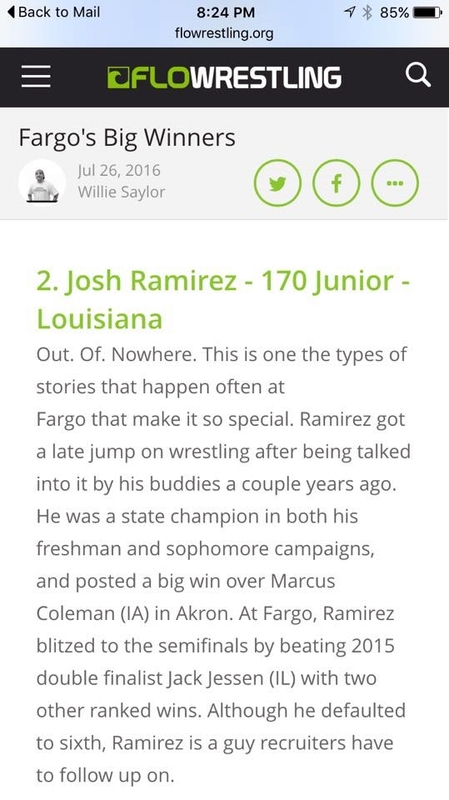 Ramirez lauded as FloWrestling's #2 "Fargo Big Winners"
FloWrestling's Willie Saylor ranked his Top-10 "Fargo Big Winners" at the USAW Cadet and Junior Nationals held in Fargo, North Dakota last week. Second on his list is the performance by Rummel's Josh Ramirez. Ramirez finished the event with an official record of 4-3, albeit in matches he actually wrestled he was 4-1. They include a 12-8 victory over Jack Jessen of Illinois, who is ranked #8 in the nation by FloWrestling, and a 12-1 technical fall over Jackson Hemauer of Wisconsin, ranked # 18 by FloWrestling. IntermatWrestle's April rankings has Colorado's Canten Marriott, who defeated Ramirez in the semifinals 6-4 en route to winning the event, ranked #17 in April. (Jessen is ranked 14th at 182 lbs. on IntermatWrestle; Hemauer is not listed.) An injury during the semifinals forced Ramirez to default to 6th-place overall. Out. Of. Nowhere. This is one the types of stories that happen often at Fargo that make it so special. Ramirez got a late jump on wrestling after being talked into it by his buddies a couple years ago. He was a state champion in both his freshman and sophomore campaigns, and posted a big win over Marcus Coleman (IA) in Akron. At Fargo, Ramirez blitzed to the semifinals by beating 2015 double finalist Jack Jessen (IL) with two other ranked wins. Although he defaulted to sixth, Ramirez is a guy recruiters have to follow up on.